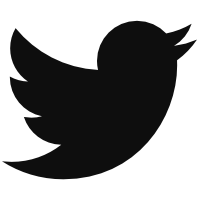 You’ll stretch yourself into pretzels trying to convince yourself that a past great is a buy low. And sometimes it’s worth it — Cole Hamels and Matt Cain seem to be doing just about the same thing they’ve ever done, and betting on their career numbers is a good bet. But sometimes, there just isn’t enough grip on the mat to reach your finger to click that trade proposal button. The mat gets slippery, and for good reason. 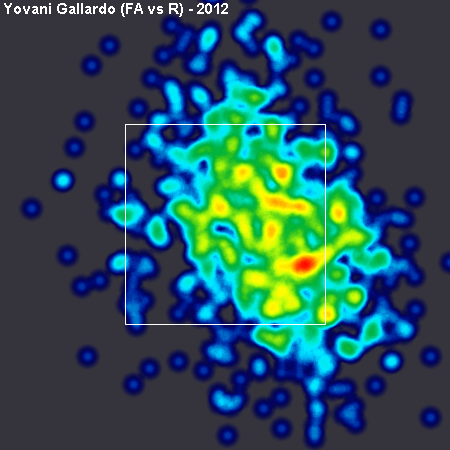 Is Yovani Gallardo just a downward-facing dog with no bounce left? The easiest spot to look with Gallardo is velocity. One of his assets in his best years was a 93 mph fastball. Now that’s down a mile per hour in consecutive years, and that could be part of his struggles this year. He’s using his sinker more often the last couple of years, but that pitch has the same velocity as his four-seamer. Still, moving from 93 even down to 90+ isn’t a deathknell. One piece of research, at least, posits that there’s little functional difference between those two fastball velocities. But there’s the fact that he’s using the sinker more. That’s interesting, maybe. According to Harry Pavlidis’ great benchmarks for pitch types, the sinker gets more ground balls than the four-seamer (52% to 36%) and fewer whiffs (5.1% to 7%). The slipperiest part of YoGa’s statistical map is the fact that his whiff rate is down to a career-low seven percent, which is also below average. You could say that his nigh-league-average strikeout rate (7.45 K/9, 18.7%) is actually lucky despite his career strikeout rate (9.07 K/9, 23.7%) being much higher. If he’s eschewing the strikeout for the ground ball, shouldn’t his ground ball rate be good? Or at least better than normal? Cause at 45% it’s just above league average and just above his own average (44.6%). And, given Matt Swartz’ research on ground balls and BABIP — which suggested that there are additional returns the further you get away from league average in ground-ball rate — we can’t really count this ground-ball rate as an asset. The child’s pose of fantasy pitcher analysis doesn’t help us either. A .319 batting average on balls in play and a 69.7% strand rate each are only inches away from ‘normal’ and ‘sustainable’ levels. And a few points of BABIP and a few extra stranded runners is not what separates Gallardo and his current five-plus ERA from the mid-threes ERAs of his past. Looking at the movement of his primary pitches only points out that his slider has lost a bit of horizontal movement, maybe, but that doesn’t seem like it explains these problems away. Is there a chance he’s not burying the fastball in on righties’ hands like he used to? 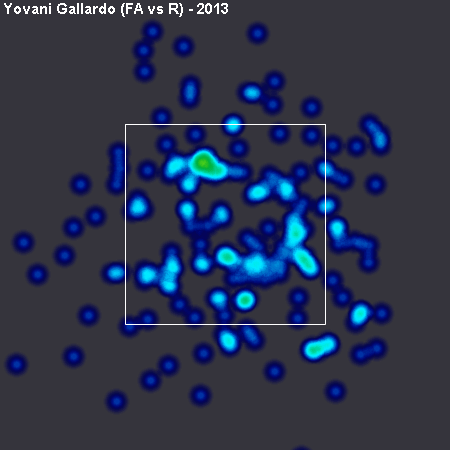 But if we’re looking for reasons that Gallardo might not be as good this year, we should return to his increased use of two-seamers. It’s possible his sinker is just not that good. He’s given up a 137 wRC+ on the pitch career, which is his second-worst number next to his changeup, which is pretty much a show-me pitch. Normally, when a pitcher alters his pitching mix and doesn’t find the results he wanted, he’ll change it up. Maybe Gallardo will stop throwing two-seamers so much and go back to the heater. And maybe then he’ll find those added whiffs and return to offering his owners the strikeouts they bargained for. But that seems like a Bikram Yoga proposition: if you’re sweaty, about to pass out, and looking to lock in that crane pose, are you going to risk it all on a 27-year-old who needs to reverse a three-year trend in his pitching mix in order to possibly give you eight strikeouts per nine and a bad WHIP? This has been doing Yoga with YoGa. We hoped you liked reading Doing YoGa with Gallardo by Eno Sarris! SO you’re saying he’s not a superstar?